When Does Chick-Fil-A Serve Lunch? Chick-Fil-A may not be as large a fast-food chain as McDonald's or Burger King, but it can't be denied that it's taken a similar hold on the public consciousness. Its chicken sandwich is genuinely iconic, enough even to warrant a warning from New York City's mayor. Sometimes you just need a good fried-chicken sandwich. In order to do that, you'll want to get to your local Chick-Fil-A anytime after 10:30 a.m. That's when most of the chain's locations officially start to ramp up to lunch speed from its breakfast hours. 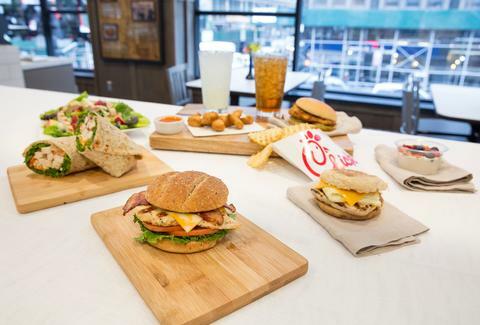 From then on, all the entree classics on the Chick-Fil-A lunch menu are at your fingertips, from the Spicy Deluxe Sandwich to the Chick-Fil-A Nuggets. You'll want to take heed though; Chick-Fil-A is closed on Sundays as well as the following holidays: Easter Sunday, Christmas Day, and Thanksgiving Day. Just to be safe, it's always a good idea to look up a location's exact hours of operation using Chick-Fil-A's locator tool.